Bernard Suen has worked in the ICT and Creative industries for over twenty years with domestic, PRC, and international consulting and management experiences. In 2010, he co-founded InTechnigence Limited, an E-Learning and E-Business service provider based in Hong Kong. 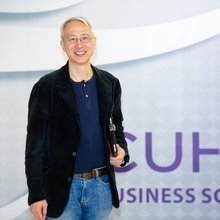 Currently, he is an adjunct assistant professor of management at CUHK Business School, project director of CUHK Center for Entrepreneurship and director of the Creativity Lab of Wu Yee Sun College, CUHK. In the past, Bernard had worked in management and executive positions with E&Y Kenneth Leventhal Real Estate Group, Emperor Group, Panorama Distribution Limited, Lovable Products (Hong Kong) Limited, yU+Co, and SharpMotion Enterprises Limited, where he was responsible for ICT and new media strategy and solution development and operations. Since 2001, Bernard has taught courses in new media, entrepreneurship, creative industries, design thinking and research and design management for The Chinese University of Hong Kong, Swinburne University of Technology, and Hong Kong Design Institute. He has also conducted workshops for organizations such as MTR, China Mobile, G4S, and Hong Kong Design Centre (i.e. the 7+1 Design and Creative Entrepreneurship Programme --- 8th Intake held annually since 2008). Bernard is also the advisor to the 2011 Hong Kong Design Index and co-moderator of the 2013 Hong Kong Design Change Roundtable Series on Design and Economy. In 2011, he completed a case-based research project funded by the CreateHK Office together with Professor Kevin Au in studying the roadmaps of design entrepreneurs in Hong Kong. He was a research team member of the Global Entrepreneurship Monitor (GEM) Hong Kong National Study 2007 and Hong Kong and Shenzhen Study 2009, lead consultant to the Incubation Programme of Hong Kong Design Centre, instructor of the Google EYE (Empowering Young Entrepreneurs) Programme and project director responsible for the training programme of the 2014 Shenzhen-Hong Kong and Guangdong-Hong Kong ICT Young Entrepreneur Programme (SZ-HK/GD-HK ICT YEP) funded by Hong Kong Cyberport Management Company Limited. Bernard is also the author of the “Eight Lessons in Entrepreneurship for Design and Creative Business” (2013) published by ET Press and co-author of the “The Heart’s Way --- Design with Empathy Through Creative Thinking“ (2014) published by the Hong Kong Design Institute.